May 22, 2012 — Prime Minister Meles Zenawi held a brief meeting in Addis Ababa with senior security officials, after returning from a two-day symposium on Global Agriculture and Food Security in Washington, D.C.
During the private meeting, the premier discussed various issues, including the recent embarrassing heckling Zenawi received in the presence of world leaders from award-winning journalist, Abebe Gellaw. Visibly furious by the ordeal, Zenawi is said to have suggested a number of unspecified measures to take against Mr. Gellaw and the Amsterdam-based Ethiopian Satellite Television (ESAT), according to a source who spoke on condition of anonymity. 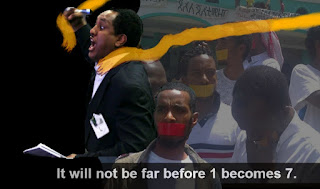 Since passionately condemning Zenawi last Friday, the Stanford graduate and ESAT journalist has become a household name among the Ethiopian diaspora. His shouting match has gained hundreds of thousands of views on youtube and is seen by many as energizing the Ethiopian opposition. With technical assistance provided by Chinese and North Korean governments, Zenawi's increasingly autocratic administration regularly jams broadcasts from ESAT, Voice of America, Deutsche Welle and ERI-TV stations. According to the Committee to Protect Journalists, Ethiopia is the second leading jailer of journalists in Africa and since 2001, more journalists have fled Ethiopia than any country in the world.